LANCASTER, California (CNN) -- The sound of pounding hooves thunders in the high desert air. A cloud of dust marks the trail of a herd of wild horses as they race across the arid plain. This is Lifesavers Wild Horse Rescue, a shelter for wild mustangs and unwanted horses near Lancaster, California. 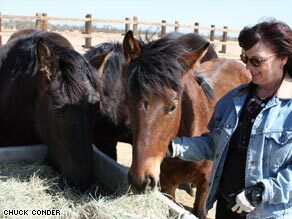 Jill Starr, president of Lifesavers Wild Horse Rescue, vows to do right by the horses: "I will take care of them." Lifesavers President Jill Starr says she and other shelter operators are witnessing an equine crisis. "People have lost their homes, their jobs, their hope," she said. "And they are giving up their animals." "We've had horses come onto the property in a horse trailer, unannounced, and just offloaded and [owners] ask us, beg us, if we could take these skinny horses," she said. "All of a sudden it's like somebody flipped a switch and people started bringing back the horses they adopted from us," she said. "There are no hard numbers on this," said Michael Markarian of the Humane Society of the United States. "The states don't seem to be keeping numbers. The economy has been hard on everybody, and animals are no exception." Shannon Bonfanti is a case in point. A freelance fashion industry worker, Bonfanti says that jobs have dried up, and so has her income. "When I was working I was able to take care of all the expenses," she said. But she has since decided to sell three of the six horses in her stable -- to save her family as much as $800 a month. "How do you sell your kids?" a tearful Bonfanti asked. So far, Bonfanti has found no buyers. Not even for Hunni, a horse that has won trophies and ribbons in national riding competitions. "I'm willing to take almost any offer," Bonfanti said. "I know my trainer would say I'm crazy. 'You can't give that horse away. She is valuable.' "
Bonfanti even considered the county animal shelter as a possible solution. "I had contacted a few people," she said. "And the factor that there is the possibility that a horse could be put down made me look further." Last year, the Los Angeles County shelter took in 188 abandoned or abused horses -- up 600 percent from the previous year. Veterinarian David Byerly says the numbers are even worse this year. "It has not leveled off in any way," Byerly said. "It just keeps going up." Byerly says that for the first time, the county has had to euthanize abandoned horses because its facilities are full. Horses considered likely adoption candidates are spared. Even so, the Los Angeles County animal shelter is killing abandoned horses at a rate of three or four a week. That is not a fate that James Gulledge wants for his horse, Rico. Gulledge says he first met Rico at the Lifesavers shelter. "I was volunteering over there and just fell in love with him," he said. But now the economy is forcing some hard choices. "I'm very conflicted about it," Gulledge said. "It's just a decision about paying for him or having some money to help some important people make it through all this." Gulledge chose to return Rico to Lifesavers. For Starr, the horse is one more mouth to feed, and she intends to. "I'm hoping that this is the worst of this, that we are going to climb out of this pretty soon," she said. In the meantime, she said, "I will take care of them and won't let anything bad happen to them. ... They're basically family members."